Sorry, couldn’t resist. Cypress Hill were huge when I was in high school. Since you’re here, I’m assuming you do want to be a rap star. Or at the very least, record a few tracks for fun. You can’t do that without a microphone. But what mic do rappers use? The truth is: that’s an impossible question to answer. Everyone favors a different mic. And there are so many, it would take you days, even weeks, of research to find the best for your purpose. Plus, it changes every year. The best mic of 2018 is not still going to be the best mic for rap vocals in 2019. 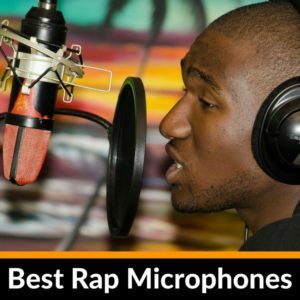 With this article, we hope to eliminate all of that research and give you the top microphones for rappers. We have the best overall with two runners up. We also found the best budget mic and the best premium option. No matter who you are, one of these 5 mics will be right for you. All of the microphones we’ve chosen are XLR mics, which means that you will need to purchase a mic preamp (and often an XLR cable) in addition to the mic. USB microphones just can’t deliver the same quality, but if you prefer a mic that just plugs into your computer with no need for additional equipment, we also have a post on the best USB mics for rap (it also includes a breakdown of the pros and cons of USB mics). The Audio-Technica AT2020 is our number one choice for those on a budget. It sells at a low price and still delivers decent sound quality, though nowhere near that of the other mics listed on this page. It has a wide frequency range, but you’ll probably have to EQ the vocal output. The best of the high-quality microphones is by far the Neumann TLM 103. It delivers an exceptional output quality that is virtually identical to the input. Your rap vocals suffer no distortion or coloring at all. And with an ultra-low self-noise level of just 7 dB(A), you won’t hear any interference from the TLM 103 either. ​The C214 Cardioid Condenser Microphone by AKG Pro Audio is the best recording microphone for rap. It’s very reasonably priced for a condenser mic and comes bundled with almost everything you need. You get the mic, an H85 shock mount, a close-talk windscreen and a sturdy carrying case. The one thing you don’t get is an XLR cable, so you’ll have to buy that separately (this is true for most mics). ​If you’ve been researching microphones, you’ve certainly heard of AKG’s legendary C414. Even if you haven’t heard about it, you’ve definitely heard it. It seems like it’s in use in every big recording or broadcast studio and on tons of stages. It’s also very expensive. The C214 was designed as the cost-effective alternative to the high-end C414. You can get the same exceptional quality, but pay much less. The AKG C214 has an outstanding dynamic range and is great for close-up recording of high-output sources up to 156dB SPL, with a switchable 20dB attenuator and bass-cut filter that also help reduce the proximity effect . It has an integrated suspension, which reduces mechanical noise and vibration. All of this makes it the best mic for recording rap vocals. It delivers a crystal-clear reproduction of your voice and when you mix vocals and instrumentals, the vocals always sit well in the mix. If you tend to yell into the mic or just have a loud voice, this is one of the few mics in this price range that can handle that perfectly. The best studio microphone for rap is also great for the road, with an all-metal die-cast body and shock-resistant and scratch-resistant finishes. While it is by no means cheap, the price is actually quite low, when you take into account the quality you’re getting. If you were hoping to spend a bit less, check out the Rode NT1-A (one of our runner ups) below. The NT1A Vocal Condenser Microphone from Rode is a definite step down in quality, but it’s not a huge step. The step is much larger when it comes to price, which makes this a great value. Moreover, at the time of writing, it is being sold as a complete kit that includes the mic, a 20-foot XLR cable, a Rode SM6 shock mount with integrated pop shield, a dust cover and the NT1-A Studio Secrets DVD. It is also covered by a 10-year warranty. The NT1-A has a large 1 inch capsule with gold plated diaphragm and a low self-noise level of only 5dBA, making it one of the quietest studio microphones on the market. This is one of the things that makes it such a good microphone for rapping. The SM7B Vocal Dynamic Microphone from Shure is the only dynamic mic listed here. Generally condenser mics are preferred for studio rapping, while dynamic mics are preferred for live performances. Condenser mics produce clearer sound, but they also pick up ambient sound much easier, which is why dynamic mics work better on a stage. Dynamic mics also cost a lot less, which means you can get a much higher quality microphone for a much lower cost. The Shure SM7R is expensive, but in terms of quality, it comes very close to the much more expensive Neumann TLM 103 condensor microphone (see below). Overall, I would recommend a condenser mic for rappers, but if you don’t mind going with a dynamic one, you’re not going to find a higher quality microphone at this price. It is one of the best mics for rapping. Furthermore, it ships with a foam windscreen, a close-talk windscreen and a locking yoke mount. ​The Audio-Technica AT2020 Cardioid Condenser Studio Microphone is easily the best budget microphone for rap. It generally sells for under $100. In terms of quality, it is quite good, but nowhere near the other mics on this list. It’s the bottom limit I would drop to, but it will still give you good-quality recordings. Personally, I wouldn’t use it for studio work, but it will work fine for home recordings, though you will probably have to EQ the output. The AT2020 has a custom engineered low mass diaphragm that gives you a wide frequency response (from 20-20,000 Hz), which makes it especially well-suited for rappers. It has a wide dynamic range and easily handles high SPLs. A cardioid polar pattern reduces the interference of sounds from the sides and rear and makes for much better isolation of the sound source you’re trying to record. Audio-Technica’s AT2020 is not the best mic for hip hop vocals, but it is easily the best at this price range. If you need to make professional quality recordings, look elsewhere. But if you’re looking for an excellent mic for home use that won’t cost a ton, you can’t beat the AT2020. ​If you want the best mic for rap, look no further than the Neumann TLM 103 Condensor Microphone. It’s going to cost you, but it’s worth every penny. It comes packaged with a shock mount and a briefcase. If you don’t need them, there is also a version with just the mic, which saves you a bit of money. It is available in satin nickel and matte black and it comes with a 2-year warranty. The TLM 103 is a large diaphragm microphone that features an extremely low self-noise level of just 7 dB(A), which allows it to pick up even the most barely audible nuances. It has a wide frequency range from 20 Hz to 20 kHz and a high sound pressure level capability up to 138 dB, so it can handle even the loudest rappers yelling right into it. The TLM 103 has a very broad presence boost in the area of 6 to 15 kilohertz. This helps your voice cut through the mix. The mic works with a transformerless output stage that ensures a clean sound that is as close as possible to the original source, with a powerful bass transmission at even the lowest frequencies. There are better microphones than the TLM 103 from Neumann, but they cost ten times as much. For most of us this price level is as much as we’re willing to spend (more, actually) and in this price range, the German-made TLM 103 is the Rolls Royce of microphones. It will take your rap recordings to the next level. As mentioned above, all of these microphones will need a microphone preamp to power them. Most don’t come with XLR cables to hook them up to the preamp, so you will need one of those, too.